La Dante in Cambridge is a non-for-profit cultural association and is part of the international organisation La Società Dante Alighieri, which was founded in 1889 and has 500 offices worldwide. Our aim here in Cambridge is to promote knowledge and enjoyment of Italian and Spanish language and culture, and to bring together like-minded people who want to learn more about what Italy and Spain have to offer. We run a wide range of courses and workshops for all ages and abilities. We have adult courses which range from holiday Italian to advanced exam-based classes. For children and young learners our classes are based on games, songs and role-play, and make learning fun. We also offer business Italian, intensive one-to-one lessons and summer schools. In fact, however you enjoy learning, there’s something for you! Our approach is to create a unique blend of learning language and culture at the same time, which research shows is the quickest way to achieve a higher level of language proficiency. We also offer a wide variety of cultural and social events for our members. These include cookery classes, cinema screenings, talks and tours at local museums, and events that form part of Cambridge’s Science Festival and Festival of Ideas. You can also come along for informal Italian conversation practice with others at your language level, at our regular free conversation sessions. We can supply native-speaking translators, interpreters, voice-over artists and other services such as copy-editing and proof-reading. We already supply organisations such as RAI and the BBC, and our professional translators are selected for their qualifications, language skills and experience. We also provide English classes with expert teaching from highly qualified English native speakers. The small classes, which are in a friendly school environment, focus on real-life activities through drama and situational learning. 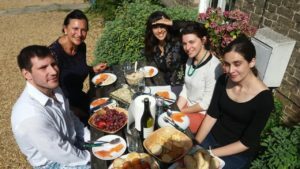 We offer Spanish classes as we want to promote and spread Spanish language and culture as well: all about Spain from language tuition to films, evenings with native speakers watching a movie or dancing tango, a thorough way to learn and immerse yourself in Spanish life in the heart of Cambridge.